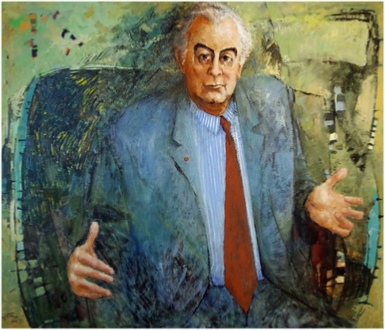 Below left: Gough Whitlam (Labor) did a massive dummy spit after being dismissed by the Governor General (don’t blame him). 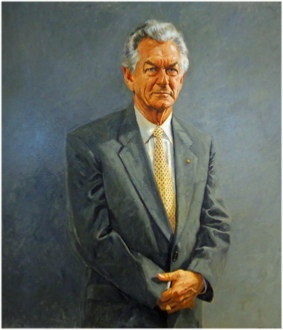 When asked to sit for the obligatory portrait he responded typically with “You can have this Archibald prize winning portrait of me or nothing” or something to that effect. So there it is, standing out like the proverbial sore thumb. 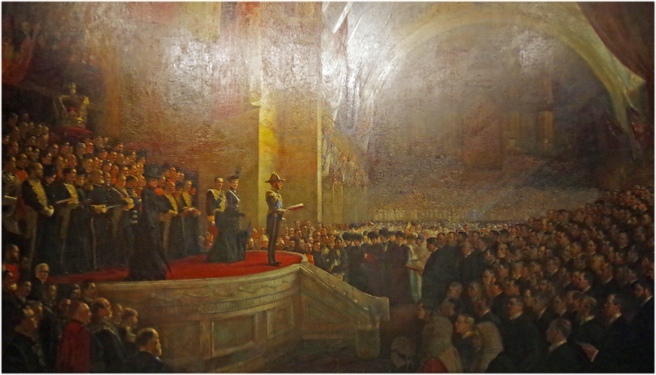 Below and Below Right: One of the most notable paintings in the Parliament House collection is Tom Roberts’ famous 1903 painting “Opening of the First Parliament of the Commonwealth of Australia in the Exhibition Building, Melbourne, 9 May 1901 by H.R.H. The Duke of Cornwall and York”. (Later King George V). Measuring 5.65 metres across and 3.6 metres tall, it is painted on three separate pieces of canvas, stitched together. The lectern in front of the railing holds the key to the identity of the faces that can be seen in the painting - all 250 of them. The contract required Roberts to include recognisable likenesses in the finished work, including the Duke and Duchess of Cornwall and York, the Governor General, each State Governor, Members of the new Commonwealth Parliament and other distinguished guests. The commission presented enormous challenges and took two years to complete. He had to travel extensively within Australia and to London to produce individual portrait sketches in oils and pencil. Soon after its completion, the painting was presented to King Edward VII, and sent to England. It remained there for many years, hanging in St James’s Palace until 1957, when Her Majesty Queen Elizabeth II agreed to return the painting to Australia on permanent loan. 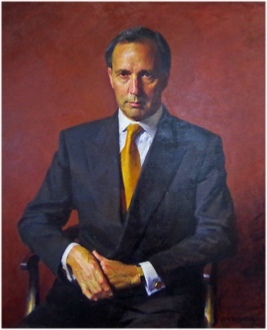 The painting was too large for its intended home at Old Parliament House in Canberra, and for many years it was in storage and only occasionally displayed. In 1981, after a major conservation project, it was hung in the new High Court of Australia building in Canberra. 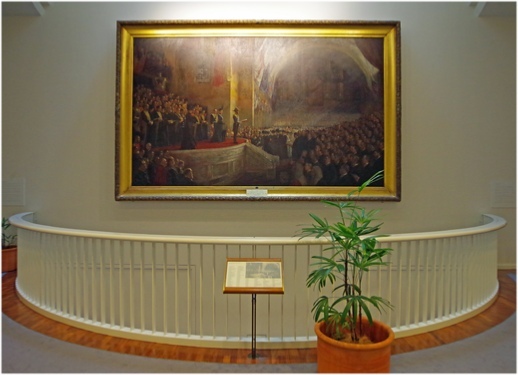 When the new Parliament House was designed, a dedicated space for the painting was included in the foyer to the Main Committee Room, at the very heart of the building. This area includes architectural features such as a skylight and balustrade that were designed to echo Roberts’ original composition. And finally…Billy Hughes was Australia’s seventh Prime Minister, serving from 1915 to 1923. He holds the record for continuous service as a member of the House of Representatives: 51 years and 7 months. Hughes was Prime Minister during some of the hardest years of WWI. He travelled to Great Britain in March 1916 and spent five months trying to influence strategy at the highest level. 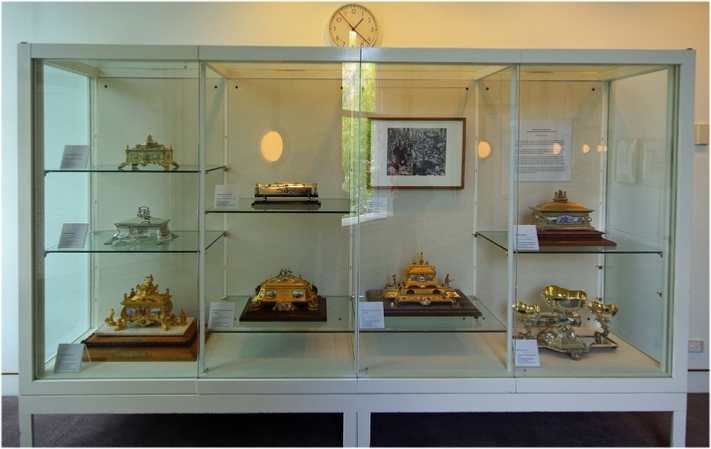 The Freedoms of the City awards in the cabinet (right) were all presented to Hughes during this tour. In total he was honoured with fifteen during his tenure, more than any other Prime Minister. Phew! 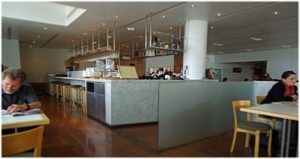 After all that, time to get some food at Parliament House’s Queens Terrace Cafe - yum.